For many aspiring piano players, the very thought of having to remember all the keys on the keyboard seems frightening. Luckily, it's not so hard – at least not as hard as you think. The keyboard on the piano may seem big and complicated, but there are certain patterns you can learn. By doing this, you'll manage your way through the keyboard easily. So, how to find out what it’s all about? The black keys are ordered in groups of threes and twos, right? If you focus on the piano keyboard, you'll see that there is a pattern after all. If you only want to learn how to play for yourself, of to play in a local band and such, you should immerse yourself in "real" playing as soon as possible. This is especially important if your goal isn't to become a music scholar and know the music theory like the back of your hand. The answer to this problem is – by learning the note positions along with the names of notes. If you want to play the C major scale, you'll know which tone to start from – but how will you find it? Because you may learn all the scales out there, but that doesn't necessarily mean you'll know how to play them on the piano. The problem with this approach is that you'll end up running around in circles. You have a book of scales and you memorize all the scales in the back log. The so-called "old school" way of learning the ﻿notes is with a book in front of you. Two black keys, then three black ones, etc. Now, the most important thing here is to make sure you've located the C note. The C note is commonly referred to as the starting point of all notes and scales, so it's good to learn its position first. The C note is the one located before the two-key black set. You may wonder: "Well, aren't there many sets of two black keys?" This only goes to show that there is a lot of repetition going on. After a scale is finished, there's another one just like it, and so on. Instead of thinking that a piano has an endless number of scales coming one after the other, look at it as only one scale. Yes, it's just one scale repeating over and over again. We have "high" notes and "low" notes, but they are different only in their pitch. For example, high C and low C are one and the same note, in a different pitch. We mentioned that a C note is found before a group of two black keys. If you go up the scale, and pass eight notes, you'll reach another C note. The reason for this is because you've passed an octave. An octave is a group of eight notes, from a lower one to a higher one. Once you understand this principle, everything will be easier. When you sit in front of a piano, look at the middle of the keyboard, find the two black keys and then located the C note. This note is often referred to as the Middle C, because it's right in the middle of the keyboard, separating the left and right hand. Now that you know how to locate the C note on the keyboard, we can move on. The C note is just the beginning of the scale. 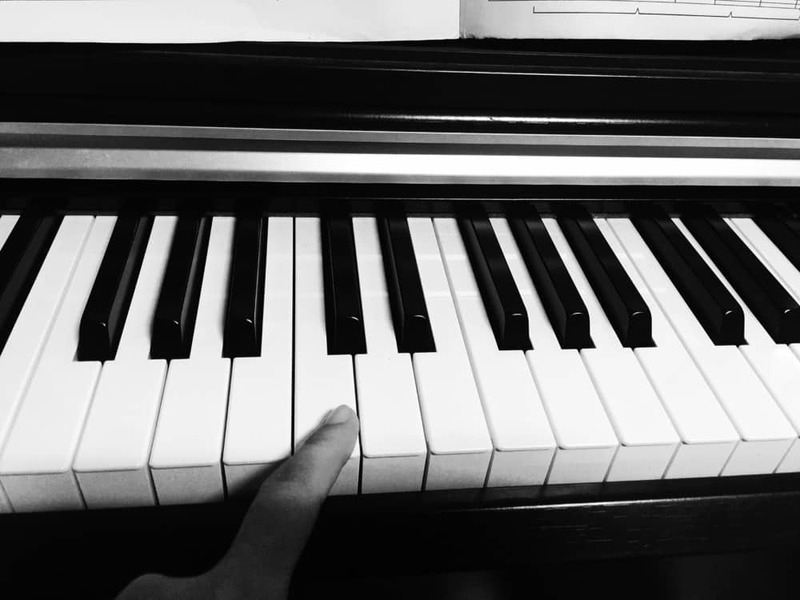 It's quite easy to learn the basic scale on the piano, because all you need to do is go up. After C, we have D, E, F, G, A, B and, again, C – only this one is an octave higher. Sometimes, these notes are also referred to as naturals. And what's extremely easy is that all of these notes are played on white keys. Now, what about the black keys? Well, they're a bit more complicated, but it's nothing to fret about. The thing with black keys is that they are used to slightly "change" the natural notes that we talked about. They are also sometimes called – accidentals. The interesting thing about them is that they can be both sharp # and flat b, depending on how you play them. Sharp means that they are half a step raised from a note, and flat means they are half a step lowered. By understanding this, you come to realize that, for example, a black key between notes A and B can have two names. It can be both A#, if go from left to right, or Bb, if we from right to left. Therefore, there are no two different tones that are created, only two different names for one and the same note. If this is too much music theory for you, know that you don't actually have to know all of this theoretically in order to play. Just be aware of the fact that the black piano keys are sort of intermediaries between the white keys, and you'll be fine. You should, however, learn the names of white keys and memorize them well. This is your basis, your starting point, and you'll eventually have problems playing if you don't master it. But there really isn't a lot to memorize because, as we said, it's one and the same scale going round in circles. If you want to find the D# on the keyboard, the easiest way to do it is by knowing where the D note is. Then, you'll simply locate it by going one key up the scale – because D sharp (#) means you're going up. If, on the other hand, you need to find the B flat, just go to the B note and move one key down, because flat (b) is one field, or on half-step down. It's really that simple once you manage to work your way through white keys and their notes. Again, you don't have to memorize all the keys, especially when you're ﻿﻿learning ﻿﻿how to play chords. Chords can be learned through constant repetition and through practicing finger positions. Many piano chords also incorporate black keys, but you really don't have to memorize the names of those black keys if you don't want to. However, simple "coordination" requires that you at least know the basics, so be sure to know where your Middle C note is. That way, you'll be able to start playing in a matter od seconds. The best piece of advice is to start small and work your way up. Set a daily goal, and try to follow through on it. First, learn the C scale, and all the white keys. Then, add a couple of black keys. Then you can practice around different scales and their respective black keys. This is especially important because not all keys start from the C note (obviously). The C note is necessary for your initial coordination, but it can sometimes be misleading, especially if you're not that proficient in other scales. Therefore, the best way is to master the white keys and add black keys later on. Many people have preferred labeling ﻿﻿the keys on their piano as a way of memorizing their positions. 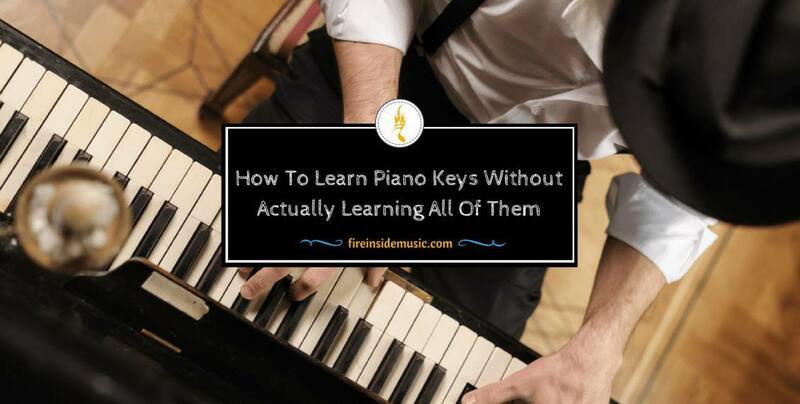 Some believe that this approach actually enabled them to learn piano keys faster, while others think that it's a hindrance to proper learning. There is no rule of thumb when it comes to this. However, it's not advisable to label your piano keys if you've passed the beginner level. 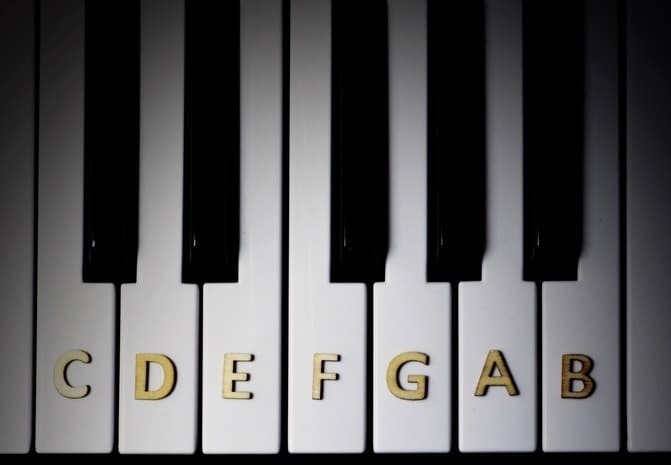 If you're a novice, or you only have the basic knowledge of the instrument, you can label the keys. But if you're an aspiring pro, or you want to master the piano at a higher level, you should definitely avoid labeling the keys. Anyway, let's see what the best way for labeling is, in case you belong to the first group. Basically, there are two "schools of thought" when it comes to this. You can either color-code the keys or label them with letters i.e. note names. Both of these will improve your memorization process, and help you remember the note positions on the keyboard. Somehow, for a great number of piano learners, color-coding worked better than letter-marking. The reason for this probably lies in the fact that we are predominantly visual beings, and we enjoy seeing shapes and colors more than seeing letters and numbers. Yes, it may seem a bit confusing to mark all your G-keys with, let's say, blue, and all your F-fields with green, for example. We're used to marking items with letters and numbers, and it may seem somewhat confusing. 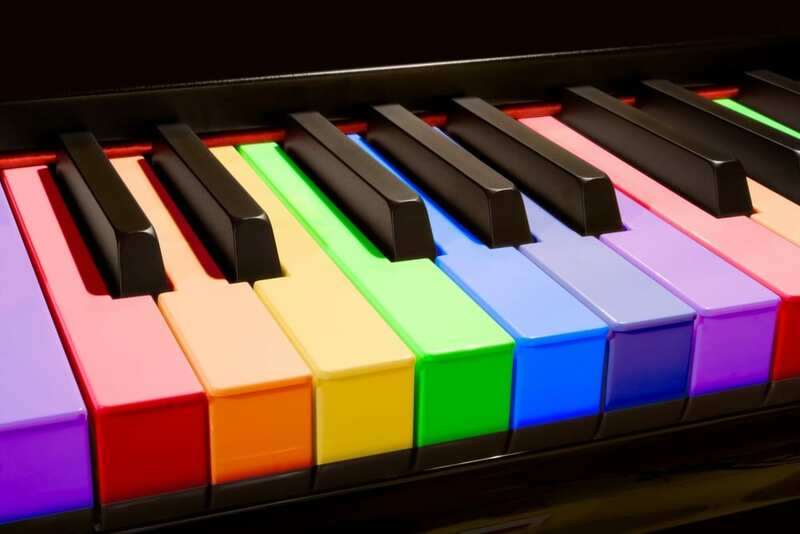 But your brain will somehow find the way to connect the colors on the keys with proper positioning, and you will eventually master them. Mind you, there's nothing wrong with labeling the keys with note names. It's perfectly "legitimate", as it can also take you where you want. For some people, marking with keys letters works better than color-coding. There’s even another method for learning – by having a piano keys chart in front of you. We're just stating the facts, and it's up to you to choose the best method for memorizing piano keys. 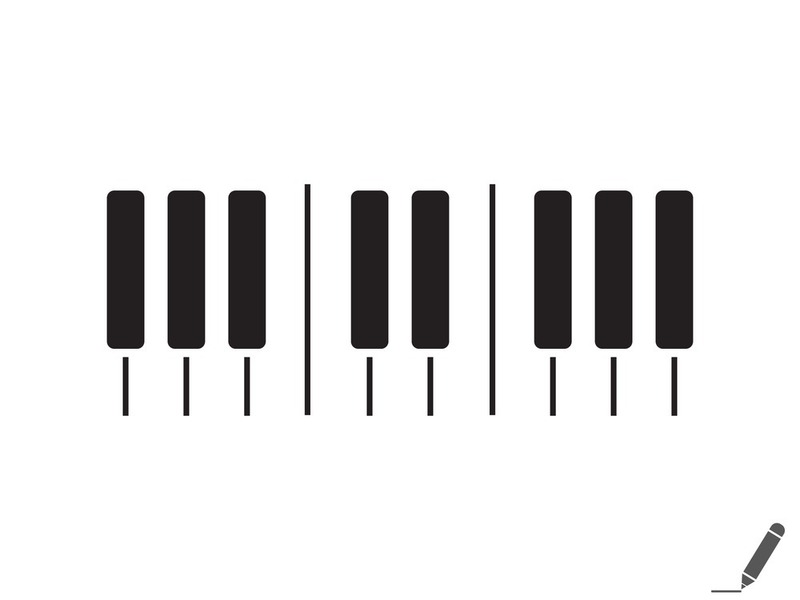 Unfortunately, labeling piano keys can help you for a limited period of time. As easy as useful as it may seem, you will eventually have to get rid of it. The piano isn't meant to be played with labeled keys – it's unprofessional and, in a way, childish. A true player has to be able to play their instrument of choice without any "outside help" in the form of labels, markings and such. The only way to improve your playing is by losing key labels as soon as possible. If you keep labels for too long, they will end up hindering you. You will never develop enough self-confidence to move on and grow into a full-fledged piano player. Labeling your keys is definitely helpful at an early stage of your learning, and we do recommend it. However, it will eventually have to subside and go off the keyboard – your future playing depends on it. This is also one of the things that can cause you problems early on. With different keyboard sizes, you may get confused and, in a way, lost. This shouldn't worry you too much, because it's easy to find your way once you know how. Basically, you have two ﻿﻿types of keyboards – those on pianos and those on digital keyboards. 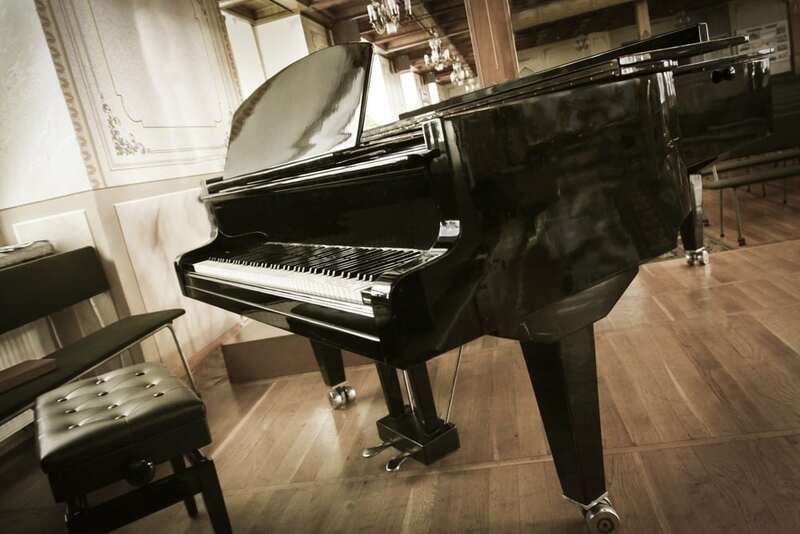 Piano keyboards have 88 keys, 36 black ones and 52 white ones. This is just to give you an idea of what is out there. There are many different types of keyboards, but that shouldn't worry at all. If you learn how to find the C note, including the Middle C, and if you know the names of white keys in a scale, you won't have any problems. Mind you, some keyboards start with an F note, some start with an E and some with an A. All that you should be interested in is finding the C note, right before the group of two black keys. The rest will work out by itself, as long as you lay the groundwork properly. 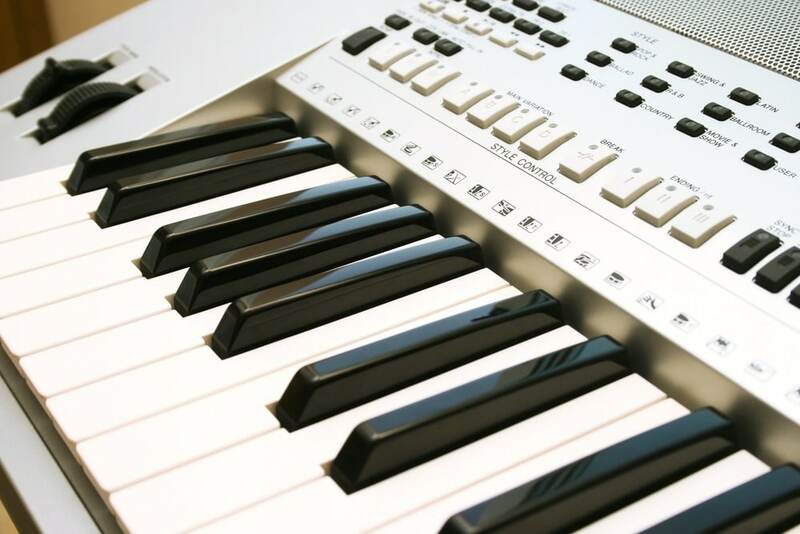 There are many types of keyboards to choose, depending on what you want to achieve as a piano player. However, it's always best to go with an 88-key if you want to get a professional sound and experience the utmost quality of piano playing. But before all of that, the most important thing is to learn how to find the C note and memorize the white keys. Then, add some black keys, and keep practicing. Eventually, finding all the right keys will become second nature to you.